These fittings are made of corrosion resistant stainless steel and now thread into the cylinders/helms via Positionable O-ring hose ports. Fittings can be easily orientated in any direction to accommodates tube routing. see this page through page 9-14 for details. CAUTION: For use with -3 helms and cylinders only. CAUTION: NOT for use in an NPT helm/cylinder hose fitting port. For ORB, -3 Cylinders/Helms ONLY. 1) Refer to illustration Figure E.
this length by three for the amount of tubing required. FIGURE E: 2nd Steering Station/autopilot when using 3/8″ nylon tubing, or, 3/8″ copper tubing. ITEM No. DESCRIPTION PART No. QTY. REQ. *For NPT helms use HF5502. a) A compensating line is required between helm stations or the helm and autopilot power pack. 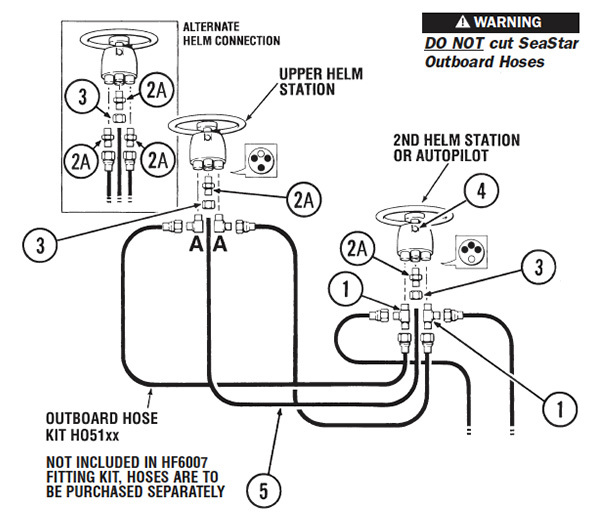 b) All hoses should be routed with a gradual rise (particularly the compensating line) so that air will not be trapped in the lower helm station. 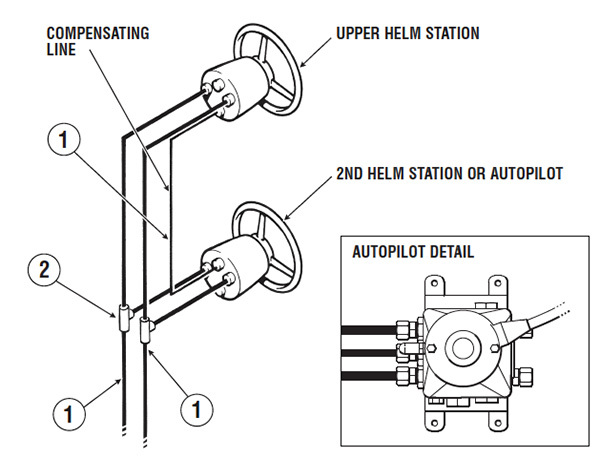 c) The second helm station or autopilot power pack may be connected at any location between the upper helm station and the cylinder. For existing single station installations the nylon or copper tubing may be cut and the tee fittings installed at any convenient location. CAUTION: DO NOT cut SeaStar Steering Hose. REQUIRED DETAILS FOR THE ADDITION OF AN AUTOPILOT. 1) SeaStar Helm pumps are fitted with a built in check valve which are required for installations of additional steering stations and/or autopilot pumps. If your helm pump is not fitted with an internal check valve an external valve will be required. 2) Autopilot mfg. requires the volume of your steering cylinder(s) to provide an adequate autopilot pump, refer to page 12-2 for cylinder specifications. Fitting kit to add a 2nd station or autopilot to an outboard system. ITEM No. DESCRIPTION QTY. PER KIT PART No. NOTE: HF6007 Fitting kit is to be used when the system has been plumbed with SeaStar outboard steering hose only. NOTICE:Typical plumbing layout shown. 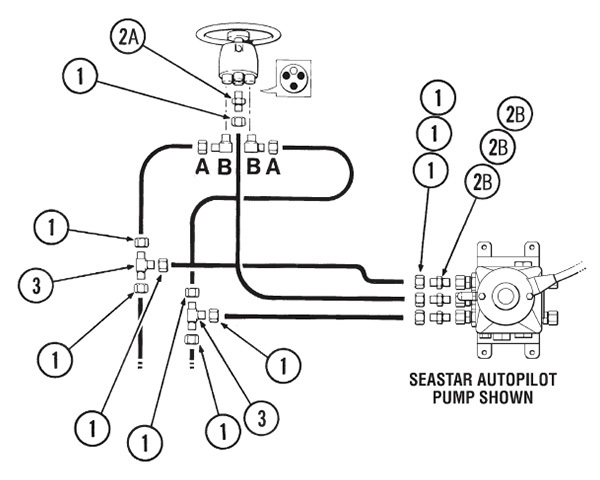 When using a SeaStar Autopilot Pump, ALWAYS refer to the Installation Manual shipped with your autopilot pump. CAUTION: DO NOT cut SeaStar Outboard Steering hose. Once cut there is no means to field swage fittings to the ends of the hoses. Fitting kit to add a 2nd station or autopilot to an inboard or sterndrive system. 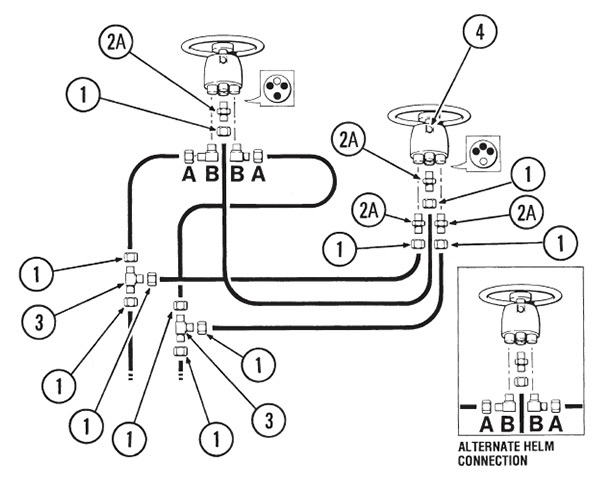 NOTICE: Typical plumbing layout shown. 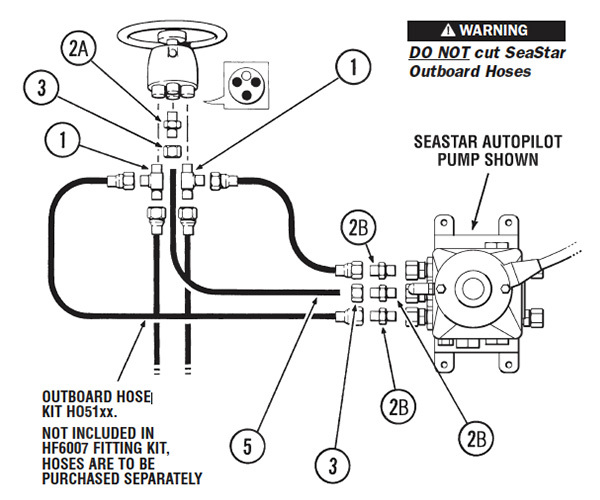 When using a SeaStar Autopilot Pump, ALWAYS refer to the Installation Manual shipped with your autopilot pump.